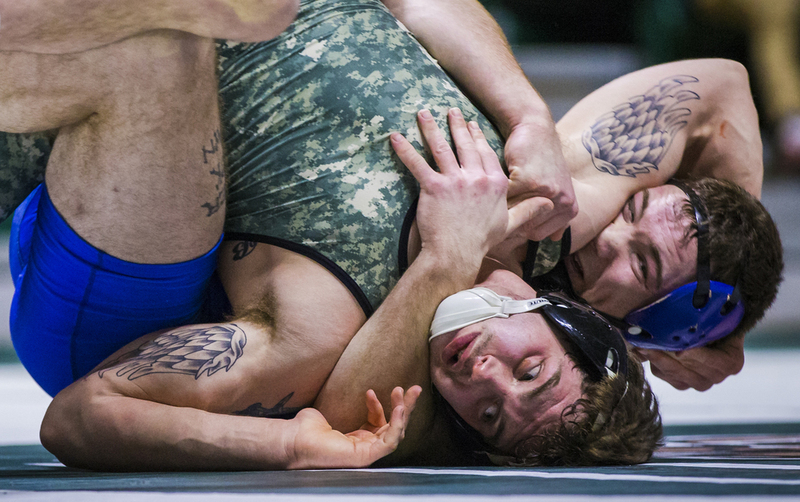 Ohio University redshirt junior Cody Walters battles with SUNY Buffalo wrestler Wally Maziarz in the Convocation Center in Athens, Ohio, on Jan. 25, 2015. Walters won in a 2-0 decision. Ohio won overall 24-13. Fans take pictures of a bodybuilder at the Arnold Classic Sports Festival in Columbus, Ohio, on March 4, 2017. Ohio infielder Ty Black slides in safe while stealing second base during the Ohio vs. 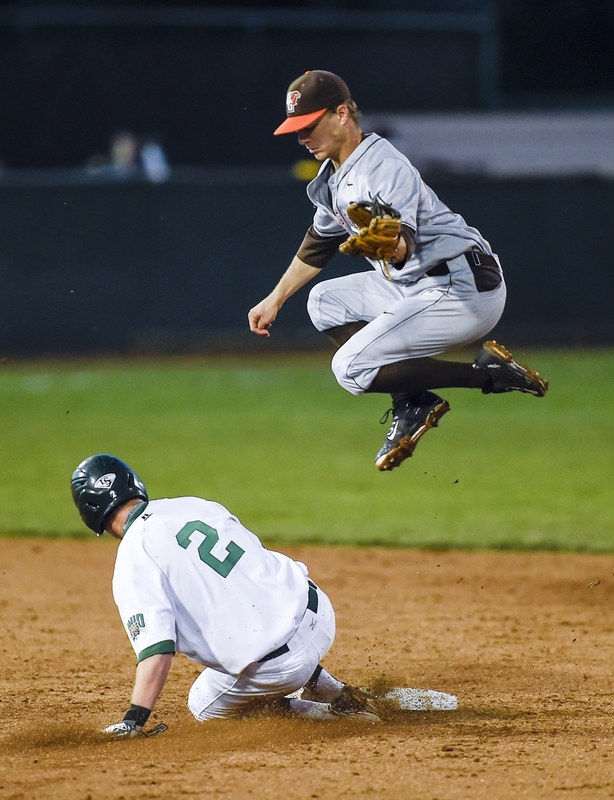 Bowling Green game at Bob Wren Stadium in Athens, Ohio on April 10, 2015. Ohio lost 4-2. (left to right) Troy Griffin, 11, Reese Griffin, 7, and Tyler Cowell, 11, of Gilroy, Calif, hang out in between races at the USA BMX 2017 Las Vegas Nationals at South Point Arena on Sunday, July 16, 2017. 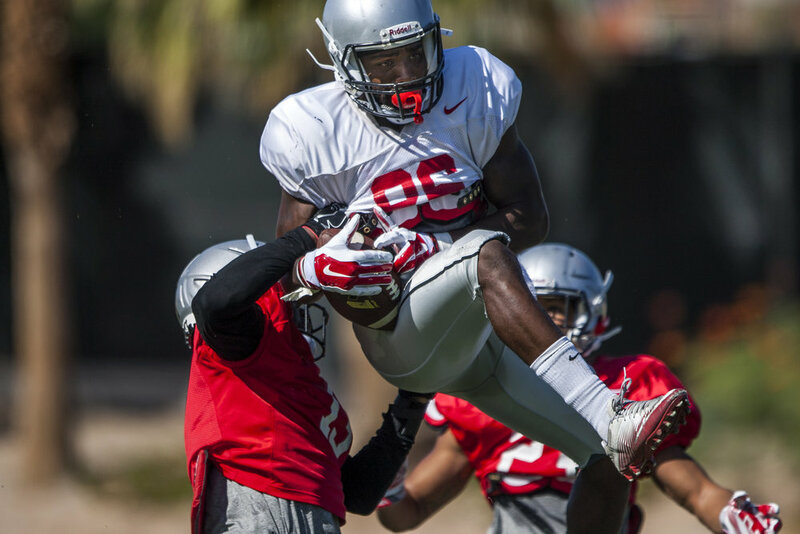 UNLV wide receiver Darren Palmer tries to hold onto the ball as defensive backs Tim Hough, left, and Robert Jackson, right, try to take him down during football camp at Rebel Park on Tuesday, Aug. 15, 2017. Carter Grimes, a swimmer with the Sandpipers of Nevada, practices at the Desert Breeze Aquatic Center in Las Vegas on Thursday, June 22, 2017. A competitor performs her pole fitness routine during the Arnold Classic Sports Festival in Columbus, Ohio, on March 3, 2017. 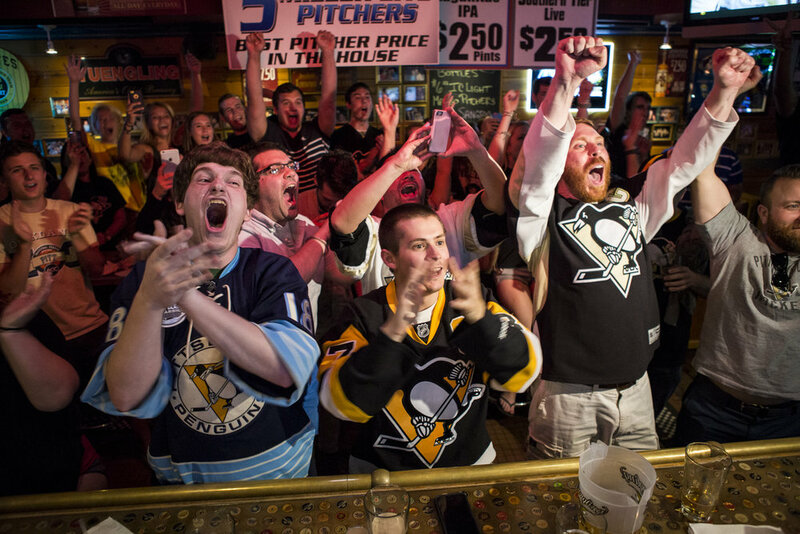 John Firestone, left, Evan Wright, center and Brent Krysinski celebrate as the Penguins won game six and the Stanley Cup at Hemingway's Cafe in Oakland on Sunday, June 12, 2016. 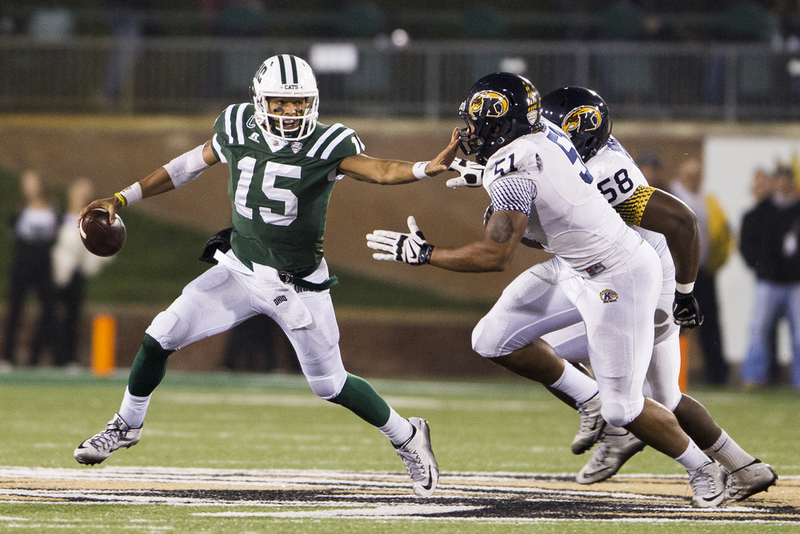 Ohio University redshirt senior quarterback Derrius Vick wards off Kent State defenders Terence Waugh and Theo Eboigbe at Peden Stadium on Nov. 11, 2015. Ohio won 27-0. A heavyweight throws in the shot put event at the St. Andrews Highland Games in Scotland on July 29, 2015. Ohio junior forward Lexie Baldwin, left, attemps a layup against the defense of Central Michigan guard Crystal Bradford, right, at the Convocation Center in Athens, Ohio, on Jan. 17, 2015. 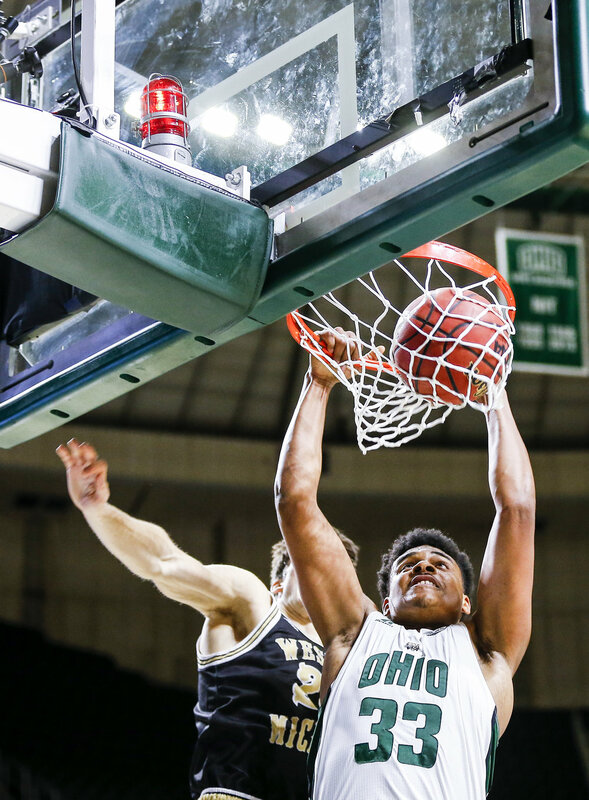 Ohio won 71-51. Latrobe infielder Aimee Siecinski is tagged out at home plate by Hempfield catcher Madison Stoner during the first round of PIAA playoffs at California University on Monday, June 6, 2016 in California. Hempfield won 4-0.